I know a girl who lived for a season in Sweden. She moved to America as an exchange student and grew close to her host family. One day she shocked her host parents with a question: “Do you recycle?” she asked. “Yes we do,” replied the hosts with confident sensibility. “Where do you recycle these,” asked the young woman. 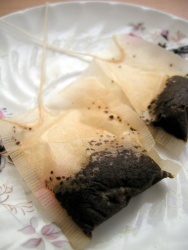 And she held out a dismantled tea bag with staple separated from string separated from grounds. When it comes to the fish and trees and animals of this world, I want to save the environment. I want to be part of an awakening. Part of the green revolution. Part of the solution. Yet, I do a thousand things a day to add to the problem. I throw away compost-able food. I trash plastics that I simply do not want to clean off. I drive when I could bike. I forget to bring in the totes to the grocery and get another round of plastic bags. It goes on. So what is the issue? Am I lazy? Do I really not care? Maybe I am lacking in a degree of radical. Whatever the solution, a revolution is not going to begin because of regulation shift in law or policy. The green revolution will happen one heart at a time. It will happen when ten people in a large community are truly transformed with a vision of sacred earth. So, like any transformation process, start slow. Make realistic changes. And let your heart lead you. Technical changes in your lifestyle and new year’s resolutions spring out of the same heart that has always been. For the green revolution, I would rather send its soldiers to spend time in the hills and fields than give them a top ten list of recyclables.